The Mason County 4H Camp’s Dining Hall has been busy the last two weeks as camp wraps up for the season. Volunteers are raising money to replace the structure which dates back nearly 70 years. 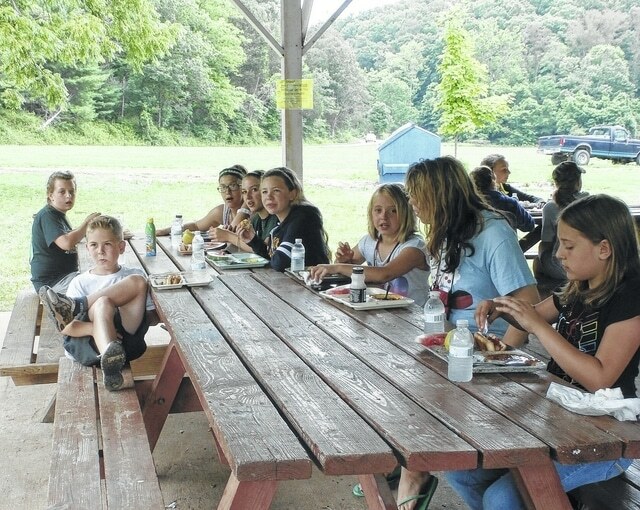 Campers have their last lunch of the season at 4H camp on Thursday. An auction on Saturday will help raise funds to replace the dining hall with a new building. SOUTHSIDE — The dining hall at the 4H camp has been getting a lot of use in the last couple of weeks and on Saturday, the effort to build a new dining hall will get a financial boost with a special auction. The auction, which will consist of items from the Home Shopping Network and QVC, takes places at 6 p.m. Saturday at First Church of God’s Community Building. Doors open at 5 p.m. and concessions will be sold. All proceeds will benefit the new dining hall that volunteers have been trying to bring into existence for more than a year. The U.S. Army National Guard has agreed to help build the structure if the materials are provided. However, it’s going to cost around $70,000 just for materials and to get the building built. The start date for this construction is next June, though campers may not get to use the dining hall until summer 2017. Still, the facility is desperately needed. The existing dining hall’s kitchen is thought to be 50 years or older with the original part of the building 60 or 70 years old. Clearly, a building of this age does not meet a number of requirements, the least of which are those with the Americans with Disabilities Act (ADA). It needs electrical work, the roof leaks and the floors are separating. There is no heating or cooling. In addition to hosting two camps a year for local Mason County 4-H’ers, the 4-H camp has also hosted 4-H members from Boone County because that organization has no camp of its own. With a new dining hall, it’s thought the property could be rented and utilized even more throughout the year. Currently, the dining hall committee has a special fund set up through the county where checks or donations can be dropped off at the tax office in the Mason County Courthouse. A brick campaign is also under way to raise money where a donation of $100 will purchase a brick with up to three lines inscribed on it and placed at the new dining hall. The lines could be names or organizations for those both living and those who have passed on. Contact the WVU Extension Office for questions or to make a donation for the project at 304-675-0888.